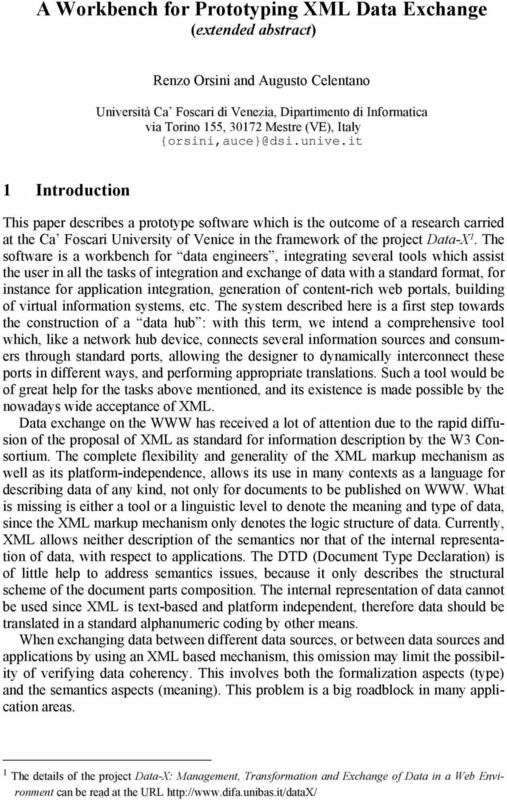 Download "A Workbench for Prototyping XML Data Exchange (extended abstract)"
4 Figure 2. A panel showing results of DTD matching. must cover as much as possible of the two structures. From the conceptual viewpoint, types and labels in the nodes must correspond (at some extent). A thesaurus defines weighted synonymy among names, while type compatibility is defined a priori. Figure 2 shows one of the panels of the tool, showing the results of a match. 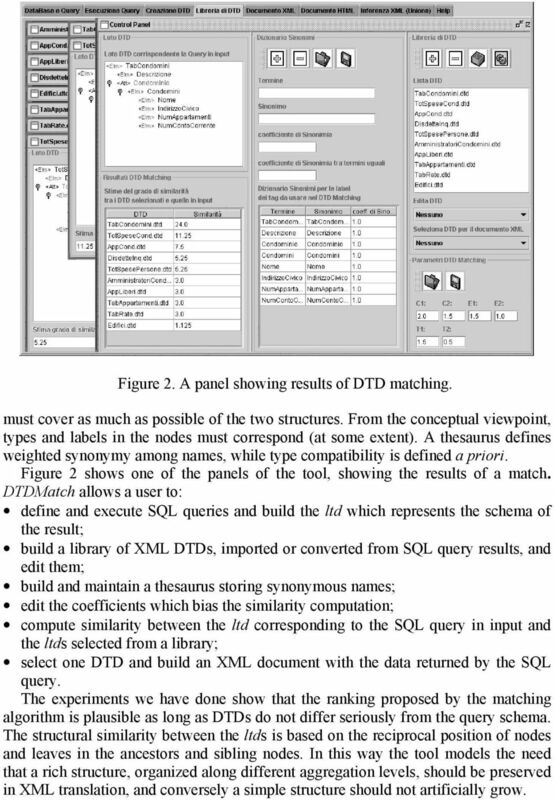 DTDMatch allows a user to: define and execute SQL queries and build the ltd which represents the schema of the result; build a library of XML DTDs, imported or converted from SQL query results, and edit them; build and maintain a thesaurus storing synonymous names; edit the coefficients which bias the similarity computation; compute similarity between the ltd corresponding to the SQL query in input and the ltds selected from a library; select one DTD and build an XML document with the data returned by the SQL query. The experiments we have done show that the ranking proposed by the matching algorithm is plausible as long as DTDs do not differ seriously from the query schema. The structural similarity between the ltds is based on the reciprocal position of nodes and leaves in the ancestors and sibling nodes. In this way the tool models the need that a rich structure, organized along different aggregation levels, should be preserved in XML translation, and conversely a simple structure should not artificially grow. 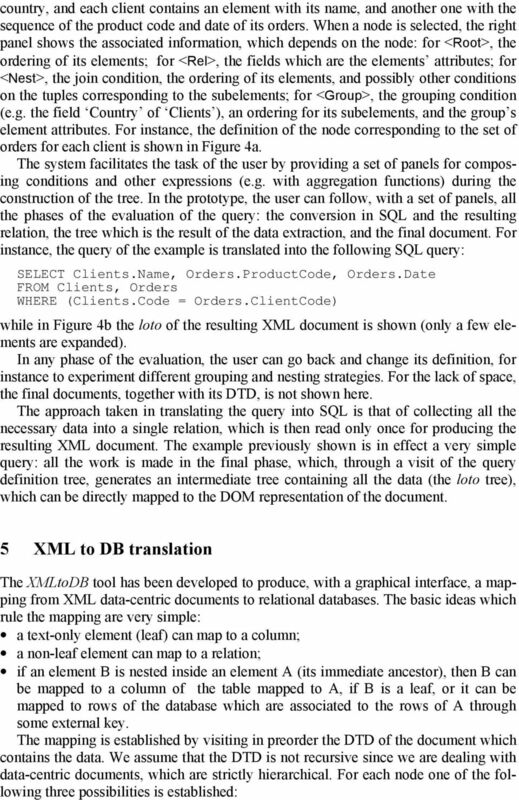 5 4 DB to XML translation and data exchange The DBtoXML tool has been built on top of Visual SQL-X [5, 7], a visual system which assist the user in querying a relational database to produce XML documents of arbitrary complexity. Differently from the DTDMatch tool it is not based on the automatic selection or generation of the document schema. Rather, it is a fully interactive tool that allows a user to specify step-by-step the structure of the query and of the corresponding XML document. The queries are expressed in SQL-X, an extension of SQL which, with a style reminiscent of report generation languages, allows the extraction of trees of data from a relational database as XML documents. The tool hides the language syntax to the user, by providing a graphical interface which allows the construction of a query as a tree, which reflects the structure of the expected result. An example of query is shown in Figure 3. 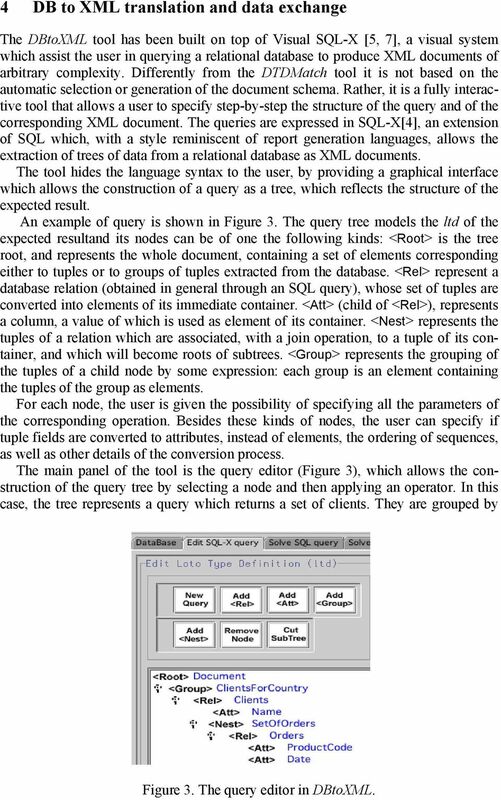 The query tree models the ltd of the expected resultand its nodes can be of one the following kinds: <Root> is the tree root, and represents the whole document, containing a set of elements corresponding either to tuples or to groups of tuples extracted from the database. <Rel> represent a database relation (obtained in general through an SQL query), whose set of tuples are converted into elements of its immediate container. <Att> (child of <Rel>), represents a column, a value of which is used as element of its container. <Nest> represents the tuples of a relation which are associated, with a join operation, to a tuple of its container, and which will become roots of subtrees. <Group> represents the grouping of the tuples of a child node by some expression: each group is an element containing the tuples of the group as elements. For each node, the user is given the possibility of specifying all the parameters of the corresponding operation. Besides these kinds of nodes, the user can specify if tuple fields are converted to attributes, instead of elements, the ordering of sequences, as well as other details of the conversion process. The main panel of the tool is the query editor (Figure 3), which allows the construction of the query tree by selecting a node and then applying an operator. In this case, the tree represents a query which returns a set of clients. They are grouped by Figure 3. The query editor in DBtoXML. 8 Figure 5. The XMLtoDB tool templates that can be adapted by the user to particular tasks. 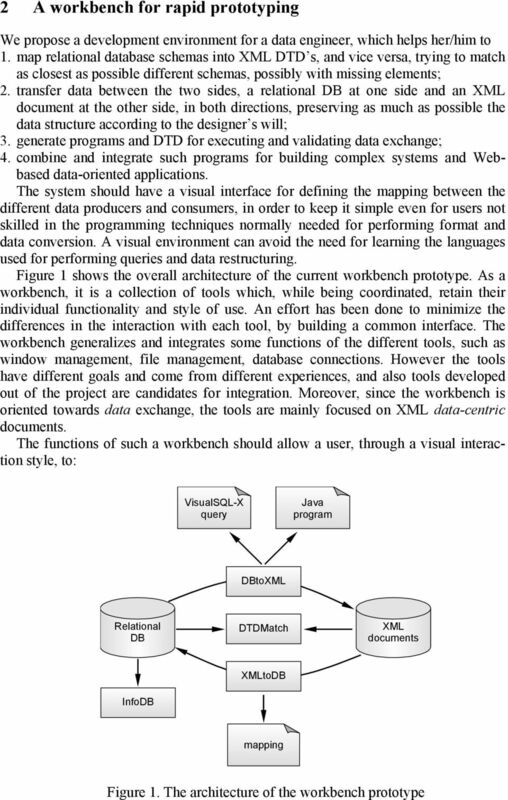 The workbench prototype integrates with a unique, coherent interface several independent tools for the exchange of data in XML format. 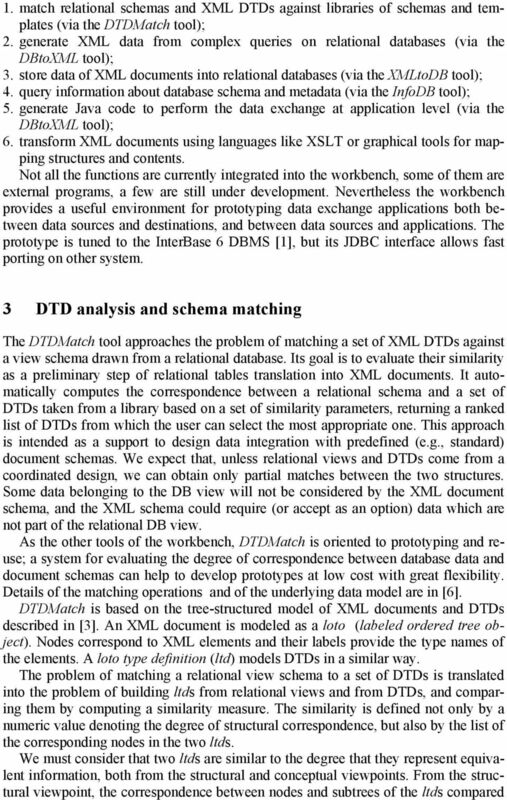 Until now the DBtoXML and XMLtoDB tools are completely integrated, while the DTDMatch tool is still external. New tools are being developed to extend the functionalities of the system, like a DTD to DTD mapper, which translates XML documents in other documents with different DTDs, as well as new facilities for working with complex projects. 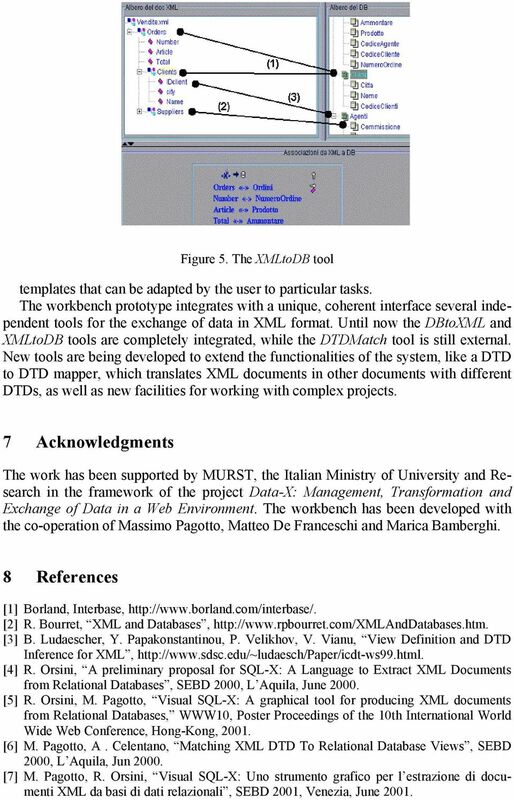 7 Acknowledgments The work has been supported by MURST, the Italian Ministry of University and Research in the framework of the project Data-X: Management, Transformation and Exchange of Data in a Web Environment. The workbench has been developed with the co-operation of Massimo Pagotto, Matteo De Franceschi and Marica Bamberghi. 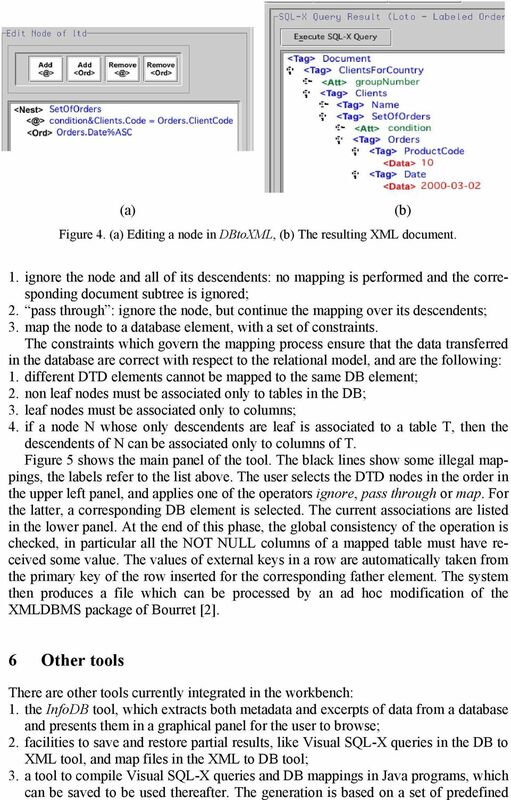 8 References  Borland, Interbase,  R. Bourret, XML and Databases,  B. Ludaescher, Y. Papakonstantinou, P. Velikhov, V. Vianu, View Definition and DTD Inference for XML,  R. Orsini, A preliminary proposal for SQL-X: A Language to Extract XML Documents from Relational Databases, SEBD 2000, L Aquila, June  R. Orsini, M. Pagotto, Visual SQL-X: A graphical tool for producing XML documents from Relational Databases, WWW10, Poster Proceedings of the 10th International World Wide Web Conference, Hong-Kong,  M. Pagotto, A. Celentano, Matching XML DTD To Relational Database Views, SEBD 2000, L Aquila, Jun  M. Pagotto, R. Orsini, Visual SQL-X: Uno strumento grafico per l estrazione di documenti XML da basi di dati relazionali, SEBD 2001, Venezia, June 2001. 1. The first generation of DBMS is represented by systems a. Hierarchical and CODASYL systems. b. Relational model c. Network model 2. Which of the following SQL statements are helpful in database redesign? Quiz! Database Indexes. Index. Quiz! Disc and main memory. Quiz! How costly is this operation (naive solution)? COMP 378 Database Systems Notes for Chapter 1 of Database System Concepts Introduction A database management system (DBMS) is a collection of data and an integrated set of programs that access that data. A Visual Language Based System for the Efficient Management of the Software Development Process. Internet Technologies_1. Doc. Ing. František Huňka, CSc. Oracle University Contact Us: 1.800.529.0165 Oracle Database 10g: Introduction to SQL Duration: 5 Days What you will learn This course offers students an introduction to Oracle Database 10g database technology. XML Programming. Duration: 5 Days Price: $2595 *California residents and government employees call for pricing. Q4. What are data model? Explain the different data model with examples. Q8. Differentiate physical and logical data independence data models. MULTICHANNEL HUB. Elena Cigliano (elena.cigliano@csp.it) Andrea Crevola (andrea.crevola@csp.it) Lara Marcellin (lara.marcellin@csp. An Introduction to Using XML for the Management of Laboratory Data Mark F. Russo, Ph.D. Bristol-Myers Squibb Pharmaceutical Research Institute Princeton, NJ 08543-4000 USA Email: mark.russo@bms.com A.
Achille Felicetti" VAST-LAB, PIN S.c.R.L., Università degli Studi di Firenze! 3D-COFORM Mapping Tool! Achille Felicetti" VAST-LAB, PIN S.c.R.L., Università degli Studi di Firenze!! The 3D-COFORM Project! Work Package 6! Tools for the semi-automatic processing of legacy information!